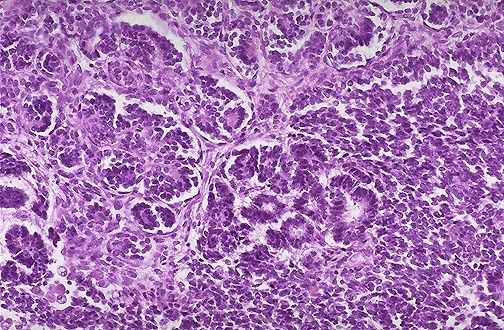 Wilms tumor microscopically resembles the primitive nephrogenic zone of the fetal kidney, with primitive glomeruloid structures glomeruloid structures and a cellular stroma. Wilms tumor is associated with mutations involving the WT1 tumor suppressor gene on chromosome 11. This neoplasm is very treatable with an excellent prognosis and >80% cure rate overall.